When you think "fashion week," you likely envision confident models strutting celebrity-lined runways, brandishing the latest creations from high-end designers in Paris and New York. But Fashion Revolution Week is something else entirely. Launched as a single day of activism on April 24, 2014, Fashion Revolution has grown into both a global week of awareness and a movement that seeks to change the way our clothes are made. The goal is to unite the fashion industry, politicians, and consumers to ensure clothing is made in a safe, clean, and fair way—and that supply chain practices from farmer to consumer are transparent. Like many grassroots movements, Fashion Revolution was born out of necessity and, in this case, out of tragedy. On April 24, 2013, in the Savar Upazila of Dhaka District, Bangladesh, the Rana Plaza collapsed. Home to a number of textile factories for top global brands, the five-story building collapse killed more than 1,100 people and injured more than 2,500. One of the largest industrial accidents in history, the Rana Plaza disaster was unfortunately not the first or last of its kind. Dangerous workplaces—those housed in structurally unsafe buildings, in dirty and dangerous working conditions—are not uncommon in countries like Bangladesh. Workers in these places are often underpaid, forced to work long hours for little pay to support their families. They may live below the poverty line, or be subject to exploitation and abuse. Aside from increasing awareness about the conditions under which most clothing is made, Fashion Revolution cites five major achievements made over the past five years. Consumers and brands are paying attention and responding. Fashion supply chains have become more visible through social media. More than 1,300 factories in Bangladesh have been inspected since Rana Plaza and 1.8 million garment workers have received factory safety information. Factories and exporters in other countries are following suit, publishing data about working conditions and increasing wages. Brands are reducing the use of toxic chemicals and cleaning up their supply chains. Photo source: Mata Traders, a Serrv fair trade partner in India. 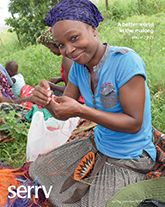 At Serrv, we pride ourselves on nearly 70 years of putting the livelihoods, dignity, and rights of workers first—and practicing business in a way that supports these ideals in 24 countries worldwide. We pay our artisan partners up-front, which reduces their financial risk and allows them to purchase materials and pay their workers while Serrv handcrafts are being produced. (50% is paid at the time of order, and the remaining balance when products are exported to the United States). As a nonprofit, we also reinvest revenue in our artisan partners to support social programs, grants, and special projects (read more in our annual report). "In essence, when you purchase a Fair Trade-certified product, it's a guarantee that it was traded in a more ethical way and really that boils down to safer working conditions, improved livelihoods, and protections for the planet." 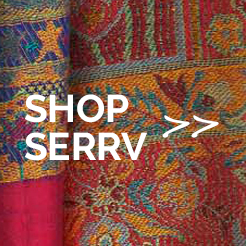 Many of the artisans who create Serrv's apparel, accessories, and handbags are women. Thanks to employment with fair trade, many of these women are given the flexibility to work from home so that they can earn much-needed income while raising their families. From apparel made by MarketPlace and Mata Traders in India to handwoven knits from Allpa in Peru and silk scarves from CORR in Bangladesh, our fair trade artisan partners have and will continue to be at the forefront of honest, ethical, and transparent fashion. 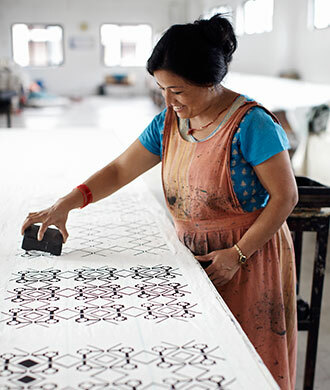 The Fashion Revolution may be far from over, but with the help of fair trade, it's well on its way. Photo source: Marketplace: Handwork of India, a Serrv fair trade partner.